Perfect gift for a loved one, wedding Memories and Family! This frame is perfect for everyone; from professionals, to parents and grandparents, they all deserve a frame that works and lets them enjoy all the memories! • Photo & 720p HD Video Playback: Mix photos (JPEG) and video (MPEG-4) in the same Slideshow. • 1280x800 High Resolution IPS (16:10) LED Backlit Display. 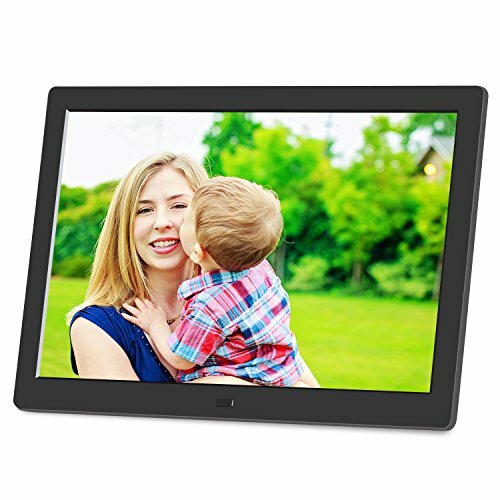 • Digital Picture frame accepts USB & SD/SDHC Card. Comes with an intuitive remote control. • Clock/Calendar Function, Stereo Speakers. You can schedule the time when your frame is on without worrying about energy wasting. High Resolution 1280 x 800 pixels IPS LED Backlit Display, can play photos (JPEG) & videos support 720P (MPEG-4/AVI). HIGH-TECH: Latest LCD screen with 1280x800 high resolution Full IPS (16:10) Built-in Clock and Calendar. USB & SD Card: Plug and play to Instantly display all your digital photos. It's that easy. Turn digital photo viewing into entertainment: 8 styles of slideshows and built-in speaker allow for playing background music and videos. Great gift idea. Promotion products, ideas and celebration for Christmas, Wedding, Thanksgiving Day, etc.